This is old news on the web by now, but I'm still getting a couple moments of fun each day from Famous Objects from Classic Movies. ADDENDUM: Just as I posted this, I finished the game with a record of 112 and 10. So there are 122 of these for now, with more, I hope, to come. Moby offers some free music for film students, indie filmmakers, and others for their non-profit film projects. A cool use of the Hulu.com embed player. Extends the water cooler discussion of great moments in your favorite TV shows to the web, allowing you to not just tell people about the scene but show it to them as well. “There is a vitality, a life force, an energy, a quickening that is translated through you into action. And because there is only one of you in all of time, this expression is unique. And if you block it, it will never exist through any other medium and be lost. The world will not have it. It is not your business to determine how good it is nor how valuable nor how it compares with other expressions. It is your business to keep it yours clearly and directly, to keep the channel open. You do not even have to believe in yourself or your work. You have to keep open and aware directly to the urges that motivate you. Keep the channel open. No artist is pleased. [There is] no satisfaction whatever at any time. There is only a queer divine dissatisfaction, a blessed unrest that keeps us marching and makes us more alive than others. I am really sick: eyes watering, nose running, throat burning. My sinuses and chest are so congested I feel like I'm breathing through one of those coffee straws. A lot of people at school seem to be sick; one professor just canceled a class tomorrow morning. It's odd to see a cold seize hold around school when the weather is 70 degrees and sunny every day. I have not slept as much or as regularly this quarter, and this weekend was really packed. Perhaps the lack of sleep has compromised my immune system. Whatever the cause, here's a sick day worth's of content. Saturday I spent as 1st AC (assistant cameraperson) on a classmate's shoot. Since this was a reshoot, we had the luxury of a 2nd AC, and it made life a lot easier. Last quarter we had one AC per shoot, and that's a lot of work for one person. You have to load and download film, take focus measurements, guard the camera, swap lenses, check the gate, clean filters, move the camera into position, swap the camera from sticks to dolly and back, pull focus, keep a camera log, set the T-stop on the lens, run a stopwatch on shots to calculate how much film was run and how much is left, mark and clap the slate, write camera reports, and more. It's a very technical position, but I enjoy it. The day started early, with a 5AM alarm buzzing in my ear. When I got home at the end of the day, I told myself I'd take a quick nap and then head out to meet up with a few friends. I woke up at 5AM the next morning. Sunday was spent at a wedding in Laguna Beach. I know nothing about the city other than what I'd seen on a few episodes of that MTV show of the same name (that show was shot beautifully on Panasonic Varicams, I believe). I'm not sure the city had any say in the matter, but that show forever cemented that town's image among most of America as the place where wealthy, self-absorbed teenagers ply their Machiavellian schemes to climb the social ladder. 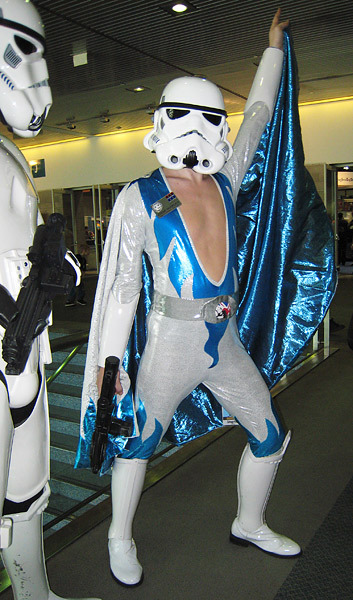 Monday, on a last-minute suggestion from Mark, I attended the last day of the Star Wars convention at the LA convention center (the official title of the event was Star Wars Celebration IV). I consider myself a moderate Star Wars fans (enjoyed eps IV-VI, watched eps I-III out of devotion), but next to the types of fanatics you'd imagine at a gathering like this, I felt like Paris Hilton at a Mensa meeting. At one T-shirt booth I asked a vendor if she had a particular Boba Fett t-shirt in large. "The second one from the right, top row?" I replied, taken aback by her hostile demeanor. She looked over her shoulder and then back down at some book she was reading. "That's Jango Fett," she muttered, and paid me no further attention. Oops. 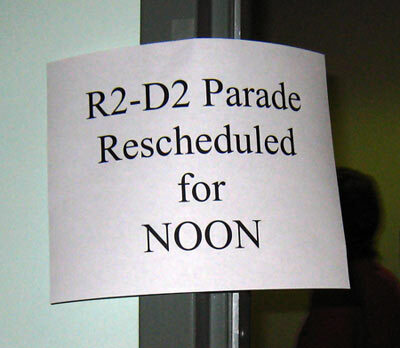 This being the last day of the convention, the schedule was very light on Lucasfilm-generated content. 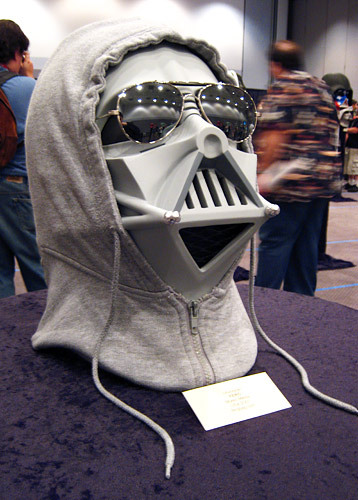 Most things to see were created by vendors or fans, from droids, action figures, and models to fan films and costumes. One room featured dozens of decorated Darth Vader helmets, much like the ubiquitous cows that appeared on city sidewalks a few years back. 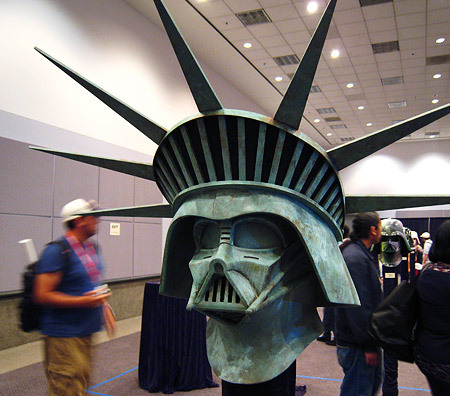 Darth as Lady Liberty? Or the Unabomber? At another booth, as I looked over some artwork, a boy of about 8 or 9 years old walked behind me holding a yoda lightsaber, one of the ones that lights up and makes lightsaber sounds when swung through the air. A booth clerk, in his early forties, stopped the boy. "The yoda lightsaber?" nodded the man in approval. "Strong choice." "It's my first one," said the boy, beaming. "That one's very light," the man explained. "Good for people who use a one-handed fighting technique, like me." He proceeded to demonstrate with some shadow-fencing, but one of his parries smacked me in the back of my head. "Easy there, Jedi," I said, rubbing my head. I watched a couple of fan films in the screening room. The ones I saw were all 2005 award winners. "One Season More" is an animated short that imagines Luke Skywalker's yearning to leave Tatooine as a musical number. It has the suitable mix of love and satire that characterizes the best of fan homages. It's one portion of Star Wars The Musical. This year's winners and entries can be seen at AtomFilms. No plans for a new Star Wars movie were unveiled, but one welcome bit of news was the announcement of a new CG series from Lucasfilm Animation: The Clone Wars. Here's a sneak peek. I really enjoyed the last animated series, Star Wars - Clone Wars, Vol. 1 and Star Wars - Clone Wars, Vol. 2. This looks to be in that style. Tuesday morning and early afternoon I spent at Disneyland with Alan, Sharon, and my two nephews Ryan and Evan. What do Disney and Lucas have in common? Both appropriated stories and built entertainment empires. Lucas took strands of Japanese film and set them in another universe (Lucas was originally supposed to direct Apocalypse Now, and Star Wars is his version of that movie, about how a small force--the Rebels--can overcome a larger force--the Empire--through sheer force of will). Disney took Grimm's fairy tales, which were indeed grim, and gave them happier endings and an animated life. Since the last time I visited Disneyland, over 10 years ago, the most apparent change is that the price of admission has more than doubled. But seeing it all through my nephew Ryan's eyes helped me to appreciate just how enduring a piece of culture Disney built. He was so excited he was a live wire--no nap needed on this day. While sitting with my nephew on It's A Small World, he almost jumped out of the boat he was so pumped up. That ride doesn't look like it's been updated one bit since my parents took me on it when I was a child (I thought perhaps we'd see young children in India answering customer service phones, or Chinese kids sewing Nikes, but the ride retains its idyllic view of the world), and yet it still kills with youngsters. Something I wondered while wandering the park: what happened to the Mickey Mouse Club? Why isn't that show still running? Look at some of the talent that came out of the sixth and seventh seasons of the most recent incarnation of the show, which ended in 1994: Britney Spears, Christina Aguilera, Justin Timberlake, and Ryan Gosling. That's the pop music equivalent of the 2003 NBA Draft that produced Lebron James, Carmelo Anthony, Dwayne Wade, and Chris Bosh, among others. The Mickey Mouse Club was so competitive that Jessica Simpson and Matt Damon failed to make the cut. I'm not sure why they ceded that space to the likes of American Idol. If Disney doesn't bring back that show, I hope they've at least retained the services of the casting director/talent scout. I miss walking the streets of NYC. Google Maps Street View allows me to revisit old favorites. Here's my old apartment. Microsoft Surface, coming Winter 2007, is one of the early products pointing towards the gesture-manipulated touchscreen interface seen in Minority Report. An upcoming June software upgrade will allow it you to watch YouTube videos on the AppleTV. The 2007 Cannes Film Festival winners. From what I've heard from folks who attended, the lineup of movies was very strong this year. Christopher Nolan is going to shoot some of The Dark Knight in IMAX format. Most features that have been projected in IMAX theatres are simply 35mm films blown up. Since they weren't framed for the IMAX theater, I find many scenes incomprehensible unless you're sitting in the back row. Audiences viewing The Dark Knight at an IMAX theater will see the movie switch aspect ratios from whatever the 35mm aspect ratio is to 1.43 to 1 when the IMAX scenes come on screen. Based on Gallup Polls, America is willing to elect a black or a woman for president, but if you're gay or an atheist (or both, I presume) your time has not come. Darren Aronofsky disses the DVD for his movie The Fountain. It doesn't have a commentary, but Aronofsky has said he recorded one himself and will post it online soon so you can listen to it while watching the movie. as many of you can tell it is light on the extras as compared to my previous dvd releases. everything at the studio was a struggle. for instance: they didn't want to do a commentary track cause they felt that it wouldn't help sales. i didn't have it in me to fight anymore. niko, my friend who did the doc on the dvd came up with a novel idea. we recorded a commentary track ourselves. we're gonna post it on a site soon, http coming soon. you can play it and watch the flick and hopefully you'll enjoy it. After the production madness of winter quarter, I thought the spring quarter might be a more relaxing one, but it's turning out to be just as, if not more, busy. Part of that is my own choosing. We're assigned to take 22 units of class this quarter as 1st years, and they recommend though do not require 1 elective. But I discovered that we're allowed to take as many electives as we want, and there's no difference in your tuition if you take no electives or a hundred. I'm interested enough in all sorts of subjects related to film that this was like being set loose in an all-you-can-eat buffet. So I signed myself up for four electives for a total of 34 units of class. I also have to edit my 6-minute film from last quarter for screening during finals week, and I have given up three Saturdays to all-day workshops led by Stephen Burum, this year's Kodak cinematographer in residence (legendary for his longtime collaboration with Brian De Palma, his work heading up 2nd unit on Apocalypse Now, and his contributions to the American Cinematographer Manual). I had one day in April which was open, last Sunday, and I spent it doing homework and laundry. In May, I also have one day that isn't already booked by class, weddings, or workshops. It's amazing how quickly all my plans for going out and working out and trying out some restaurants and watching movies all just evaporated. Being a student has one great advantage, and that's access to student-discounted software. I've finally got Pro Tools installed on my desktop and I'm learning my way around it. You can do some amazing things with the software--it's like Photoshop for sound. Add the Pitch N' Time plugin and you can turn your out-of-tune karaoke rendition of "Welcome to the Jungle" into something Simon Cowell would be proud of. One of the most enjoyable classes I'm taking is Music in Film, and our first exercise was to go through North By Northwest and log all the musical cues, when they began, when they faded out. When a director sits down with a composer for a "spotting session," the director will collaborate with the composer to select when music should come in and go out. What's fascinating about Bernard Herrmann's score for North by Northwest is how Hitchcock had Herrmann hold back on bringing in the musical cues until the last possible moment. In places you'd expect a swelling musical cue to come bursting through the speakers, there's nothing (the famous farm field scene is a great example). Our professor talked about why that might be, and that restraint is really striking given how liberally modern movies use score to cue the audience on how to react emotionally to scenes. Most viewers never stop to think about why music comes in at a particularly point in the movie, and it's a useful exercise to do with one of your favorite movie scores. Our exercise for next week's class is to spot Monsoon Wedding, a really enjoyable movie, and not just because of its score. Listen to just the title credit score, and without having seen a single frame of the movie, you should be able to predict the theme of the movie. Our professor took us on a field trip last Friday to the famous scoring stage on the Sony Studios lot. Named after Barbara Streisand, it's the scoring stage of choice for John Williams, and so many famous scores have been recorded there. On this afternoon, we had the opportunity to listen to a scoring session for an upcoming episode of The Simpsons by renowned composer Alf Clausen. While Alf conducted an orchestra in short cues to match the Simpsons footage projected on a large screen (some of the animation hadn't been finished and consisted of sketches), we sat in the control room and watched through the glass, listening to the music on one of the most sublime sound systems imaginable. It was inspiring to see how much work goes into a 7 second musical cue for a half hour episode of The Simpsons. Very few TV shows score with an actual orchestra. Lost, for one, and Desperate Housewives, though on a much smaller scale. That might be it. Who would've guessed The Simpsons would be among that elite group (I say that not to disparage the show, one of my favorite TV shows ever, but to express surprise that a half-hour animated satire would spend more on its score than most hour-long dramas). Listening to the music in the control room elevated the familiar Simpsons musical cues to a sublime place. I refuse to believe people who say they can't hear the difference between an MP3 played off of their iPod and a well-recorded CD played over a good pair of speakers. From the live performance of music to your ears, much of the magic can be lost. To hear Clausen's score live was like setting foot on a place I'd only seen in postcards before. I love hearing behind-the-scenes stories about film shoots from a wide variety of guest speakers and professors. Not surprisingly, in an industry full of storytellers and mercurial personalities, the stories that are passed around have the finely honed quality of mythology. I can't really share the stories here, but suffice it to say that events like the David O. Russell tantrum aren't new to folks in the biz. The only downside of my crazy schedule this quarter, besides lack of time for sleep and exercise, is that I've been having a series of disturbing dreams, all linked. Last night was the most disconcerting episode yet. In this dream, I've shot and killed someone, and though no one knows I'm the killer, many people are suspicious and closing in on me. Feeling the net encircling me, I spend the entire dream in a sweat, with a sense of doom and guilt crushing all the hope out of me. By the time I wake up I can't remember who it is I'm meant to have killed, but for the duration of the dream, I feel the guilt of a murderer, and it's unsettling beyond belief. In that elusive way that dreams slip through your fingers like water, I can't recall the details anymore, but I'm certain I've had this dream more than once this quarter. I realize that Freud's theories on dreams have been discredited, but I'd love to know what the current state of thinking is in the field of dream interpretation. Caught Killer of Sheep with some of my classmates tonight. Charles Burnett's 1977 MFA Thesis Film at UCLA was shot in Watts on weekends and could not be distributed due to the cost of music licensing. Ross Lipman of the UCLA Film & Television Archive restored the movie and transferred it to 35mm from 16mm, Steven Soderbergh put up half of the $150,000 to secure the music rights, and the movie is making a limited tour of the country. It is a stunning black and white elegy to life in the ghetto, and that's before considering that it was shot as a film school thesis. Thank goodness they secured the music rights (to all except "Unforgettable" by Dinah Washington for the last scene of the movie, but it's replaced by an encore performance of "This Bitter Earth" which is just as gorgeous); the soundtrack is amazing. There was a TV show called Film School on cable just two or three years ago that followed some students at NYU Film School. I watched a few episodes and never got sucked in, but perhaps that was because the show followed older students instead of first years (at least I believe it did; my memory of the show is fuzzy). My classmates and I all shot a short project last quarter using a roll of 16mm film donated by the school. This quarter, we were given four days to shoot a 6 page script. We were split into three groups, my group being, once again, the group missing a seventh member. The one condition that remained the same from our first quarter project was that we'd be assigned one of seven crew positions on each shoot each weekend. Each person would serve as one of the following crew members exactly once: director, assistant director, director of photography, gaffer, sound mixer, boom operator (since I was in the group short one person, we had to find our own boom operators). The key point is that first year film school directors are assigned classmates to serve as crew while second and third years usually choose their own crew members. Choosing your own crew probably leads to a more pleasant, harmonious shoot. But if you want the type of hysterical drama that makes for engaging reality TV, the type that inspires a sense of car crash rubbernecking on the part of the audience, filling them with a soothing schadenfreude, then handing a whole class of directors a random set of crew members is a brilliant concept. Every one in the class has one position they're best at, and one position they're worst at. You find out more about a person when they serve in either of those capacities than at any other time. Students in their second or third year shared stories of tears, fistfights, and shouting matches. After a rather smooth fall quarter on our 2-minute film shoots, I thought we'd come through the winter quarter relatively unscathed. But ah, the pressure of the film set should not be underestimated. Because we were limited to a 4 hour shoot in the fall quarter, the damage from personality clashes and skills deficiencies were minimized. But this quarter, with four days of 12 hour shoots (and more, if a director wanted to push his cast and crew into that dark forest called overtime), tiny cracks in each production team spread and grew into gaping fissures. Movie sets foster rumor the way NYC trash attracts rats. Perhaps it's the division of a crew into departments, each with its own culture and responsibilities. I've always been intimidated by union grips. Actors, of course, have a certain exalted status on set. The whole process of making a movie creates dozens of micro-stories. Did you hear that this actor was late to set this morning? Did you know that so and so lost his mind and yelled at so and so (see Russell, David O.)? Yes, it's true, she just started crying. I think he was on something--did you see his eyes? Our first quarter professor told us of recent studies that show that humans thrive on gossip, that it's a sociological instinct. After this quarter, I'm starting to believe him. Splitting our class into three different groups for the quarter promoted what is already a gossip-filled environment. Not only did we have stories to share from our own sets, but whenever we ran into someone from one of the other two groups on break, stories would be swapped as readily as cigarettes. This type of environment walks a fine line between therapeutic and toxic. At Amazon we always liked to say that brands are like quick-drying cement. It's not different with a person's reputation. That first impression is a bear to shed. I tend to shy away from drama. It's not my style to act out, and for the most part I try to keep emotion out of disagreements. But it only takes a single person to detonate a group. And so, at the end of our second quarter of film school, it becomes clearer who will work with whom next year when each director is responsible for assembling his or her own crew. I think most people have at least a half dozen or so people they'd be willing to work for, and there's always outside help, especially in LA. 2nd year shoots should be smoother sailing, but they'll make for lousy TV. The Nike+iPod is a fun running accessory, but exercise caution before using it as a serious training tool. David Pogue offers an overview of Grandcentral, a site that offers to consolidate all your phone numbers under one phone number which will ring all your phones simultaneously when dialed. I signed up during the beta a couple months ago and got a number but never used it. Pogue notes a number of nifty features that have been added since their launch, so perhaps it's time for me to dig that number out. Neal Gabler recently wrote an op-ed in the LATimes titled "The Movie Magic is Gone." Kristin Thompson finds seven points in Gabler's article and states her case against each. Another film shot mostly digitally: Zodiac was shot uncompressed with the Viper FilmStream camera in 4:4:4 1920x1080/24p. Here's a thread on cinematography.com discussing the look of the film. Here's the product page for the Viper, and here's an American Cinematographer article in which Paul Cameron discusses his experimentation with the Viper in shooting Collateral. Right now, the HD video camera receiving the most use at our school is the Panasonic HVX200. The unreleased HD video camera with the most buzz right now is the Red One. Side project of Oakley founder Jim Jannard, the Red One looks more like some powerful weapon from some first person shooter than a video camera. Here's a gallery of video footage shot with the Red One, and here's one massive 4K frame capture down-converted to 8-bit JPG. The big buzz around this camera is its sensor size: 24.4mm x 13.7mm (Super35mm). The camera is intended to offer the same depth of field as 35mm Cine Lenses instead of the higher depth of field that characterizes most video. The Red One will retail for $17,500. A working editor weighs in on Avid vs. Apple, having recently switched from Avid Media Composer to Apple's Final Cut Pro. I've tinkered with Media Composer but am more familiar with Final Cut Pro. I like some things about Media Composer better, and it is still more the industry standard for big motion pictures, but Final Cut Pro just has more momentum and resources behind it. Most film students can't afford an Avid system and are taught to edit on Final Cut Pro systems. I think Avid needs to make a stronger push to make inroads with the next generation of film editors. Posting here has been light this winter quarter because I've been steamrolled by winter quarter, the most intense three months of first year film school. We're broken into three groups of seven, and each of us here at school is given one Thursday through Sunday block to direct a six page short. The weekends we aren't directing we crew for each other. We rotate through being director, assistant director, director of photography, gaffer/grip, assistant cameraperson, sound mixer, and boom operator. I'm through all but of the film shoots for the quarter and I'm so tired that my mind suffers occasional lockups, almost like mental blue screens of death. To stay awake on set, I've invited all sorts of vices back into my life: coffee, which I have abstained from for about eight years now; Coke (the liquid soda, mind you), which I almost never drink; Mountain Dew, which I haven't had since I was in high school; and one cigarette, which I had to toss after two drags as an experiment gone awry. The caffeine hasn't been a good idea. It overpowers my exhaustion and forces me awake really early every morning no matter what time I climb into bed. Right at this very moment my body's energy tank feels like it's at 30%, just dying for some REM sleep, but instead I've just been lying on my sofa half awake for a half hour. I feel like Stellan Skarsgård in Insomnia. We're limited to a 12 hour shoot each day, but when you include equipment load and unload at the start and end of each day, we're working 16, 17, sometimes 18 hours days. When you include a day of set building and a day to strike the set on the front and back ends of shoots, and when you add in equipment rental pickups and returns, transportation to and from sets, there's almost no slack time for anything other than showering and sleeping (and for some, the former is a luxury). My group production professor recommended that once shooting started, we schedule every life maintenance task, from doing laundry to taking out trash to getting a haircut to brushing our teeth. The most mundane things fall by the wayside when in production. A seven person crew is a skeleton crew on 16mm film projects, even ones as short as our student films. If you're shooting a documentary on a camcorder with natural light, no actors to rehearse, no sync sound to record, no sets to build, then a one or two person crew is sufficient. But on a narrative film project, when there's a camera to maintain, film to load and download, lights to set up and strike, light readings to measure, actors to outfit and touch up, focus to pull, sound to record, light to shape and control, marks to set, sets to build, among countless other tasks, then a seven person crew feels light. Throw in the fact that many people are learning these roles on the job and you have the formula for some long, stressful, chaotic days. Someone serving as a gaffer for the first time is going to work about 20% as efficiently as a professional gaffer, and the productivity is even lower when you consider that on a student shoot you might have a lone gaffer dealing with a dozen or more lights for a setup. Whereas on a professional shoot you might have an assistant camera person (AC) to pull focus and guard the camera, a second AC to lay marks and grab focus measures, and a loader (to track, load, and download film magazines), on a student shoot you have one AC who handles all those duties. Every task takes longer, and the error rate for novices is higher. Our professors instruct to be patient with our classmates and to treat these first year films as learning exercises, but the truth is that most no one treats their films that way. You see your classmate sink a huge portion of their life savings into these projects, you see the effort they put into their script, into finding locations and actors, in dealing with bureaucracy and rejection, you see them scream and cry and argue, and you can't help but feel the pressure when you're crewing on their shoot. Adding the mental stress to the physical exertion of the long work days, I can't recall too many more draining four day stretches in my life than each of our shoots. You'd think that with the larger crews on a professional shoot every thing would feel more chaotic, but it's the reverse. If you've ever wondered why the end credits of a major motion picture scroll on for five minutes at movie's end, and I've certainly had that thought in the past, working on a student production sends you a long way towards an answer. If you can find a specialist for every task, someone who is an expert at that task, and their sole responsibility is to handle that task, then the director has one fewer ball to juggle. If you have an art director who snaps photos so you can maintain prop or costume continuity from one shot to the next, or a script supervisor to track eye lines, then you as the director can focus on other, more important issues, like performance. Clean division of labor makes for more efficient communications and a less stressful shoot. On student shoots you'll see overzealous directors trying to direct actors, search for props, move set pieces, set frames in the eyepiece, move lights, all in the span of a few minutes. Every one wears several hats, and that model doesn't scale up to a longer shoot. The downside of having a Hollywood-sized crew is one of cost and logistics. If an exterior shoot gets rained out, every one still gets a paycheck. On a student shoot, where many if not most of the cast and crew are unpaid, a starving student director has to eat a few more weeks of ramen. Getting a huge crew to location and finding parking for all of them is not easy. If you want to shoot a scene at your apartment to save on location costs, it's far easier to do with a compact student crew than a professional crew where you have to find space for every department. The positive to being on set for so many consecutive weeks is that it launches you up the learning curve of film production with neck-snapping acceleration. At least it has for me. I'm many years removed from my undergrad days, but I feel like a freshman again, even though I'm so much older than some of my classmates that they call me dad. I enjoy film theory classes and watching classic movies as much as anyone, but I suspect that stories of Quentin Tarantino going from video store clerk to big-time director merely by watching lots of movies while at work have filled too many heads with the idea that film consumption and appreciation alone is enough to get you 90% of the way there. The best way to learn to make movies is to make movies. The best way to learn to write is to write. The best way to become a great surgeon is to perform hundreds of surgeries. The other key element is the feedback loop. Sitting in a dark telecine room with a colorist, watching the footage from your shoot for the first time, is an amazing experience. All the correct decisions and mistakes you made on set are in your face, right on screen, and they become part of your filmmaker's intuition on the next shoot. I thought it would be difficult at this point in my life to start over in a profession. For most of my life my peers have been a bit older than me, but that time has passed. What hasn't changed is this: I've never gone wrong when choosing the darker tunnel with the bright distant light than the more well-lit hallway with the no discernible alluring endpoint. Follow your interests and you will always have the joy of your work to sustain you. I often hear people say there are jobs they couldn't take because the job title isn't palatable to them anymore. It's one of the strongest lock-in traps out there. When you make a change in profession, though, a lateral job move just isn't the norm. If you let your first career trajectory set the course for the rest of your life, you're severely limiting the amount of information on which you base one of the most important decisions in your life. I wish I could claim to be one of those people who was making brilliant home movies at age six with his father's super 8 camera, but I wasn't. I never contemplated being in the film business until just five or six years ago. It's not a profession I had any exposure to during my youth, or in college, or even right out of college. The most dangerous temptation that leads people astray is money. My first job out of college was in consulting. It paid pretty well, and with some school debt in my past, saving up some cash provided a warm and fuzzy feeling. Being able to eat out at nice restaurants, see a movie whenever I felt like it, purchase the hardcover edition of a book, and travel around the world was a refreshing change from college days. But there was only one problem: I didn't enjoy my work. I looked at the partners above me and realized very early on that I didn't want to end up like any of them. I also learned a valuable economics lesson about high-paying jobs. There are some jobs that pay really well because only a few people can perform them (major league baseball player, for example). However, most high paying jobs pay a lot to generate demand. Otherwise no one would do them for life. Consulting is one of those jobs that gradually increases your pay so that you always have enough to adjust your lifestyle higher but never have enough to retire on. I am lucky, and rather spoiled. Though my parents helped to put me through college, they never forced me to take any job for money or prestige. Even before heading out to school, my mom in her heart of hearts wanted me to head east, to a certain famous, prestigious school. I decided to go west instead, and they never said a word to change my mind. The stereotypical Asian parent encourages their child to go down the pre-med route as an undergrad. By "encouragement" I mean "brute force." My parents didn't force that on me, and I never drifted that direction. I decided late in school to double major in English, and despite having to pay extra for some summer schooling to make my requirements, they were behind me a hundred percent. When I graduated undergrad, I had another chance to head out east to my mom's favorite school, but I deferred and went to work instead. I was burned out on school. She was behind me a hundred percent. Then I decided not to go back to school at all and to take a huge paycut to go to Amazon, and though it raised some eyebrows, again they helped me to make the move. And though my mom wasn't around when I made the decision to leave Amazon and try to pursue filmmaking, I'm pretty sure if she were she would've been on my sets this year, cooking, putting up lights, chatting with my actors, and keeping my set tidy. My rule of thumb has always been to try to find work that is enjoyable four days out of five. I'm not sure there's a job out there that is fun all the time. Hard work is required and so it's dangerous to wait around until you find something you love to do all the time. However, if you're you're not excited to get out of bed and go to work at least three out of five work days, you should aim higher. I'm rambling. This hasn't been my most coherent post, but I'm not at my sharpest right now. It's been an incredibly instructive quarter. But Mr. Demille, I'm ready for my spring break. Winter quarter, first year film school, they own me. Just two more weeks to go, though, and I'll be back to a more humane schedule. For now, though, immersion is the word that comes to mind. Cheers. Adobe plans to offer an ad-supported online version of Photoshop within the next half year. That's a better idea than Photoshop Elements, the neutered version of Photoshop. It will be interesting to compare revenues from Photoshop Elements (most of which is probably a bounty paid to Adobe by other companies who bundle PS LE in with their products) with ad revenues from an online version of Photoshop. If you want to shoot slow motion, it's best to do it "in camera" as opposed to in post in Final Cut Pro or some other editing software. To see why, watch this video displaying the results side by side. Fascinating article in this week's NYTimes Magazine about the quest for an evolutionary explanation for the belief in God. Useful tips from a former Verizon sales rep.
A great tip to speed up Apple Mail, and a follow-up on how to automate that process. Final Cut Pro 6 on slate to be announced at NAB. Also rumored is Final Cut Extreme, a hardware-accelerated version of Apple's video editing software to compete with Avid. A few years from now, an interesting HBS case study can be written on the battle between Apple and Avid in the non-linear editing market. This list of cool stuff costing $10 or less is useful if you need a few belated stocking stuffers. Gosh, I've missed NYC. I'm trying to reserve judgment on LA, but I have no doubts about my adoration for NYC. Being back and strolling the streets, mingling with the people, it's like CPR for the spirit. The weather in LA is fantastic, but it didn't take long for me to realize it's an urban planning disaster with perhaps no solution to come in my lifetime. I didn't realize how draining my quarter had been until I arrived back in Manhattan the day after my faculty review. The first week, I've had to resort to drinking coffee three times to stay awake (I weened myself off of black gold in 1998), and when I sleep I have the types of vivid, often disturbing dreams I only have when exhausted. The irony of film school, at least the first year, is that students have little time to actually watch movies. The night after my last final, I wanted to go see a movie, but when I looked up show times I realized it wasn't playing in any theater in the L.A. region anymore. The last time that happened to me was...hmm, I think that's the first time that's ever happened to me. So among other things, while on break, I will catch up on movies. In fact, this winter break is a chance to catch up on everything that film school forced me to put off until later. I'm clearing out the playlist in my personal life DVR: sleep, good eating, exercise, natural light, movies, music, correspondence with friends and family (but no holiday cards this year, alas), drink, world news, the simple pleasures in life. I wish the same to all of you. Happy holidays! The black and white sequence at the start of Casino Royale was shot on Kodak's Double-X film stock. That's the same film stock I shot my first quarter student project on (The 35mm version of Double-X, used in the Bond movie, is Kodak product code 5222, and the 16mm version, which I used, is 7222). I was after a particular look, especially given that my location, a cafeteria on campus, wasn't exactly the most gorgeous setting. Double-X allowed me to work around the drab colors inside, and the film stock handled hot sunlight with aplomb. Shooting with the Double-X also allowed my makeup artist to achieve a dramatic, almost vampire-like contrast for my actress' face, the pale skin accented by near ebony eye shadow and lipstick. One movie I had in mind when thinking about how I wanted to shoot my movie was John Cassavetes' Faces, also shot largely on Double-X. I had my DP shoot handheld, and I tried on a smaller scale to have my actress channel the emotional instability of Gena Rowlands in A Woman Under the Influence. Another way I could have gone, especially if I'd wanted to preserve the option of showing my film in color, would have been to shoot on color stock and drain the color in post production. Some of my classmates shot on Kodak's Vision2 500T color film stock (5218). It's decently fast, simplifying the lighting, and if you're going to release the movie in B&W then you don't have to worry about the blue tint it will acquire when shooting in sunlight (the T after the 500 indicates that the film is designed to be shot under tungsten lights). Good Night, and Good Luck was shot on 500T. Selling off the rights to a movie in Japan these days requires shooting in color, but that's not why they chose to do so on that movie. A lot of the sets, I've heard, were painted in shades of grey anyhow because Clooney knew he wanted the movie to remain B&W in every format. Shooting color and and then desaturating in post is what many digital photographers do now. Shoot in color on your digital SLR, then use the channel mixer in Photoshop to create a black and white print. The only problem with that is that it's difficult to achieve the high contrast look and grain of shooting in B&W film in the first place. I find that many photographs shot this way contain too much in the midtones, requiring extra work in Photoshop. There's something ironic about trying to use cutting edge camera hardware and photography software to create the same look you could create with an older film camera and film stock with much less work.